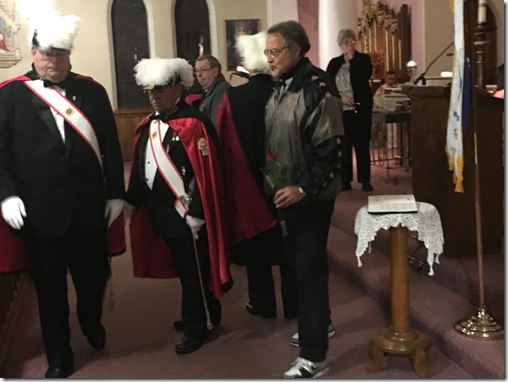 Please remember in your prayers the repose of the soul of Hendrik Nyenhuis, brother of Brother Frank Nyenhuis and his family. Please remember in your prayers the repose of the souls of Frances Culliton, wife of Brother Keith Culliton, Henrika Van Beek, wife of Brother John Van Beek and Eamon (Eddie) Halpin, brother-in-law of Brother Larry McCabe for their families. Brothers Gary Birmingham, Father Richard Tremblay, Harry Thomas, Eugene Hagen, Al Grant, Marco Eusebi, Ron Bourque, Frank Flood, and Dave Franks. The following Brothers have passed into the hands of our heavenly Father since All Saints Day 2015. May the memories of their works and friendships live on through others. As mentioned in by remarks Bob Skinner passed away. Joe Dewan is slowly recovering from hip replacement complications. Please keep all of Sir Knight’s & Ladies that are sick or shut-in in our prayers. Please remember in your prayers the repose of the souls of Brother Bob Skinner, Elisabeth Visser, daughter-in-law of Brother Harry Visser, and Donald Jamula, brother-in-law of John Price and their families. Please remember in your prayers the repose of the souls of Brothers John Meagher, Brother Clarence White, uncle of Brother Pat White, Roger Le Gros, father of Brother Ray Le Gros, and Annie Van Raay, mother of Brother don Van Raay and for their families. Brothers Gary Birmingham, Father Richard Tremblay, Harry Thomas, Eugene Hagen, Al Grant, Marco Eusebi, Ron Bourque, Frank Flood, Bob Skinner and Dave Franks. Please remember in your prayers the repose of the soul of Br. Adrian Theijsmeijer, Maureen Green daughter of Rita Stagg, and Justin Mezenberg; Grandson of Gerry Mezenberg and for their families. Please remember in your prayers the repose of the soul of Br. Ernie Walsh.